Vintage buttons are my favorite! A recent excursion into's Providence's East Side I came across an antique store called What Cheer Antiques + Vintage in Wayland Square. 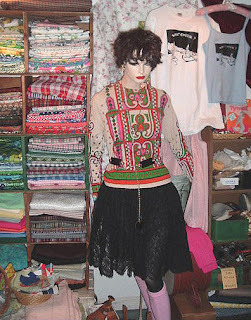 Overwhelmed by the vintage buttons and fabrics. One set of buttons stood out from the rest and I knew their purpose. 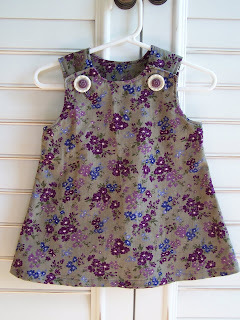 I just got finish making a little girls dress from this pretty gray and purple floral corduroy fabric. The button holes were stitched and all it was waiting for were a set of cool buttons to pull the look together. I'm happy with my choice and with the dress. I see in my future m ore trips to What Cheer! 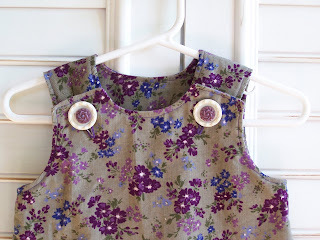 oh Beth, I love vintage buttons too! thanks for letting us know about your new discovery! Happy New Year to all, Boston Handmade! missing you here on the west coast! Beth, it is just adorable!